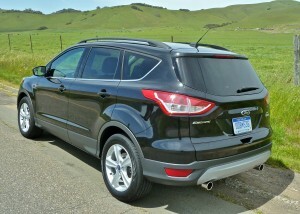 Boxy lines are gone, as 2013 Escape gains new style, power and enough features to stay atop SUV sales. SAN FRANCISCO, CA. 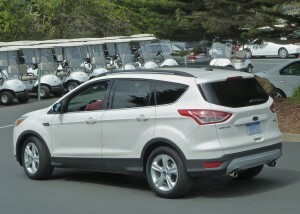 — The current Ford Escape is a sales winner, but its familiar boxy shape is being replaced by a better-looking, better-handling and more powerful and versatile model, with perfect timing to take the top-sell of the entire SUV industry to new levels of sophistication and technology for the 2013 model year. Technology and a tough economy are dominating the industry, and the Escape was positioned perfectly to capitalize on the rush toward smaller utility vehicles coupled with demands for higher fuel economy with downsized but still feature-packed compact utility vehicles. 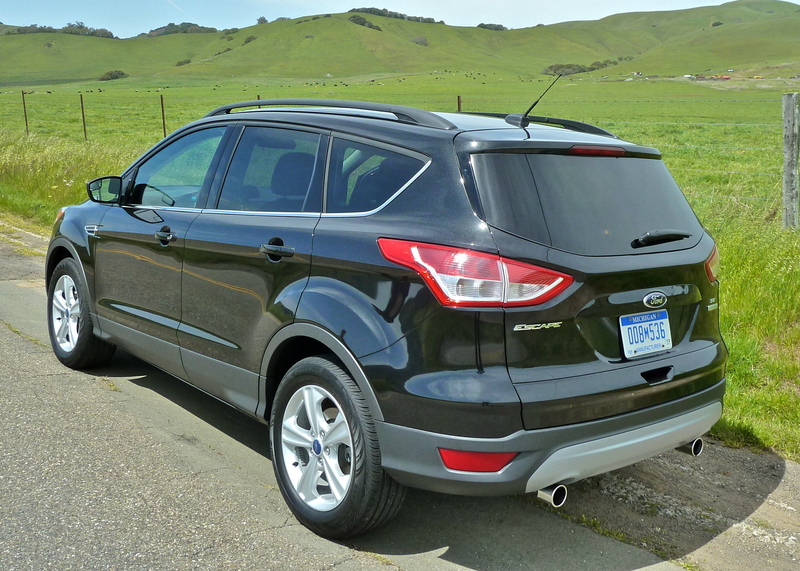 The 2012 Escape is the last of the original boxy design, and Ford did its best to fill it with its latest gadgetry during the new model’s incubation. The reward was that 2011 “was our best sales year ever, with 254,000 sold,” said Frank Davis, Ford’s executive director of engineering, and strong sales continue in 2012, especially with model-end bargains sure to come. 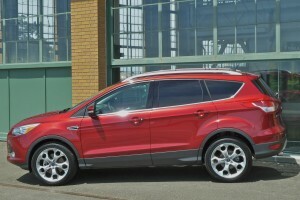 Last year’s sales success was a bit of a surprise, because the Honda CR-V had been the sales leader of the compact SUV category from 2007 through 2010, while Ford had been content to be a strong second, while focusing — so to speak — on its new Explorer, which showed a 124 percent sales increase in 2011, and the midsize Edge and Flex. The trusty Escape shot up in sales prominence with a major assist from a natural disaster. The earthquake and tsunami that struck Japan in March of 2011 seriously inhibited Honda production, most notably of parts for the CR-V. Many potential CR-V buyers seeking a new vehicle looked for an alternative, and the Escape was ready and willing to meet their demands. For the coming year, new generations of both the Ford Escape and the Honda CR-V have been introduced, which should make their current year’s battle for the top spot compelling indeed. Both vehicles are totally redesigned on the outside, and in fact share similarly sleek lines, and both also have new interiors accommodations. 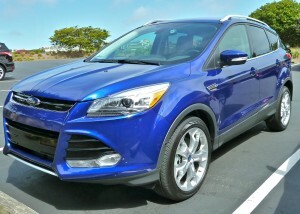 Ford gives the Escape extra push with new and more sophisticated powertrains. It may sound startling to hear that Ford has outflanked Honda in powertrain offerings, but while Honda has chosen to stay with its dependable but aging 2.4-liter 4-cylinder, as well as its smooth but dated 5-speed automatic in the new CR-V, Ford is installing two new EcoBoost turbocharged 4-cylinder engines to join the returning 2.5-liter base 4 with a new 6-speed automatic transmission in the new Escape,. Vibrant colors and stylish contours are matched by Escape's technical upgrades inside. It will be up to consumers to decide how important high-tech power is, as well as in styling and features, where the Escape and CR-V are extremely competitive with each other, just as they are with exterior and interior dimensions and stowage potential. For example, the CR-V has improved rear cargo space to 37.2 cubic feet while the new Escape has 34.3 cubic feet behind the rear seats, but when you fold the rear seats down, the CR-V’s 61.4 cubic feet is bypassed by Escape’s 68.1 volume. The bigger point of competition will undoubtedly be under the hood. Honda’s strong 2.4 engine — which can be found in early 1990s specialty cars like the Prelude, and as the base engine in the current Accord and Acura TSX — delivers 185 horsepower at 7,000 RPMs and 163 foot-pounds of torque at 4,300 revs, with a towing capacity of 1,500 pounds. Most consumers might buy a larger, beefier SUV if they tow heavier trailers, or tow a lot, but the new Escape attempts to cover all those bases. In the new Escape the base engine is the 2.5-liter 4, with 168 horsepower at 6,000 RPMs and 170 foot-pounds of torque at 4,500 RPMs, and a 1,500-pound tow capacity. Next in availability is a 1.6-liter EcoBoost, where turbocharging boosts horsepower to 178 at 5,700 revs and torque to 184 at only 2,500 RPMs, with a 2,000-pound towing capacity. The top engine is the 2.0-liter EcoBoost, with 240 horsepower at 5,500 RPMs and a whopping 270 foot-pounds of torque at 3,000 at RPMs, which has a towing capacity of 3,500 pounds. Fuel economy is another pivotal feature, and while the CR-V shows 22 miles per gallon city and 30 mpg highway (31 mpg for 2-wheel drive), the Escape models attain better EPA estimates, with the 2.5 showing 22 city/31 highway, and the 1.6 EcoBoost at 23 city/33 highway. The powerful 2.0 EcoBoost matches the CR-V’s estimates with 22 city/30 highway. The 2.0 EcoBoost, which replaces the previous 3.0 V6 without any sacrifice in power but with the promise of improved fuel economy, asks for premium fuel, while the other two will run just fine on 87-octane regular. Optional 2.0 EcoBoost gives Escape 240 horsepower, 270 foot-pounds of torque, and 3,500-pound towing capacity. Ford’s commitment to its new EcoBoost turbocharging stresses that it allows smaller displacement, for built-in mileage improvements, with the internal components built stronger so that the force-fed turbo power increases make up the disparity with larger engines, but without the gas-mileage penalty. By 2013, Ford claims that 90 percent of all its engines will feature the EcoBoost technology. The 6-speed automatic is another advantage for the Escape. While Honda engineers insist they’ve altered gear ratios and improved horsepower by 5, there is no doubt the new-breed of compact SUVs — including the Hyundai Tucson and Santa Fe, Kia Sportage and Sorento, Mazda CX-5, and now the new Escape, prove that a sixth gear is better for allowing you to be in the best ratio for all driving situations. In fact, paralleling the introduction of the new CR-V, Honda’s upscale Acura arm introduced a new similarly sized RDX, and it has a 6-speed automatic. Regardless of the figures, however, power and performance in a compact SUV becomes more a matter of perception. If it feels quick enough, it is. And the Escape feels strong and anxious to perform in both EcoBoost forms, with suspension staying firm and complementing a body that is 40 percent stiffer, leading to a very quiet interior. When we drove two of the three new Escape models at the introduction in San Francisco, I was impressed with the performance and handling precision of both the 1.6 and 2.0 EcoBoosts, although I didn’t push either of them beyond reasonable real-world driving limits. My partner, meanwhile, really pushed the 2.0 around some twisty, hilly roads, driving more as if he were qualifying for some unknown road-racing event I hadn’t heard about. Regardless, the Escape tracked well and remained stable under all conditions, although I’ll need to wait until a longer driving opportunity to more accurately assess fuel economy. Escape interior features large screen for navigation, plus hands-free controls through SYNC connectivity. There are some exceptional features on the new Escape that will jump out as examples of contemporary connectivity. 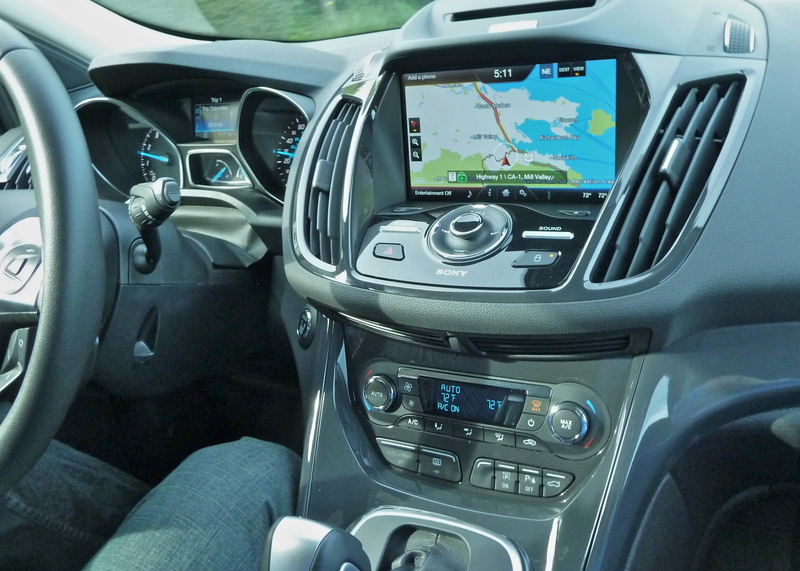 Ford has been at the forefront of connectivity with its SYNC system that includes voice commands, and it has improved the system each year, and adds My Ford Touch for further control. Pandora music and Sirius satellite radio are coordinated through a Ford partnership with Sony for its audio controls. You can even download audio books to listen to while you drive. Such features as a blind-spot sensor and parking assists are also available, but when Ford says “parking assist” it means the most impressive self-parking system in the industry. Parallel parking remains a challenge to many drivers, and Ford has come close to perfecting a system where you drive up next to the car ahead of the vacant space, shift into reverse, and engage the park-assist. Take your hands off the wheel and the vehicle will back itself into the open space, spinning the wheel and depositing you into perfect position. All you have to do is touch the brakes when you’re perfect, and it’s done. Coupled with the rear-view camera and the cross-traffic alert for backing out of a driveway, as well as forward and reverse sensing systems, the Escape can be securely moved in any direction. Beyond that, the gadgetry list is extensive. One pleasant surprise is the power liftgate, which goes beyond normal key-fob activation. Imagine approaching the Escape with both arms full of grocery bags. All you do is sweep your foot under the rear of the vehicle and the liftgate pops open and rises to expose the open storage area. Ford’s information says that special precautions in the system prevent a passing animal from activating it, but since you have to have the key fob in your pocket to make it work, I haven’t figured out how any dogs, cats, squirrels or other critters might carry the proper key. Escapes come in a variety of models, and all of them come with AdvanceTrac with roll stability control to prevent loss of control and all but eliminate any chance of rollovers; airbag systems that include driver knee bag, side airbags and safety canopy; keyless entry; LATCH lower anchors for child seats in rear; automatic door locks; traction control; AM-FM-CD-MP3 6-speaker audio with auxiliary input jacks; power points in the front, rear and cargo areas; and the 6-speed automatic transmission. The base model is the S, starting at $22,795, with the 2.5 engine. The SE starts at $25,395, adding to S equipment with the availability of the 1.6 EcoBoost and various other upgrades, such as SYNC, MyFord with a 4-inch touch screen, and foglights. The SEL adds larger optional 18-inch wheels, and availability of dual climate control, a 9-speaker audio upgrade, perimeter alarm, 10-way power seats, heated seats and exterior mirrors, leather seat trim, and perimeter alarm, for a base price of $28,195. Top of the line is the Titanium, at a base of $30,695, with all of the standard equipment of the other models, plus the high-powered 2.0 EcoBoost, push-button start with remote feature, 19-inch wheels, and options such as the titanium package with power liftgate with the hands-free function, active park assist, rear-view camera, rain-sensing wipers, and rear-view camera. All models start with front-wheel drive and have optional 4-wheel drive, and the intelligent 4-wheel drive system provides a larger dose of power to wheels with better traction in slippery conditions, and also has torque-vectoring, which reads multiple computer impulses to coordinate the trajectory of the vehicle and the intended direction based on steering input. If you’re driving around a left curve in slippery conditions, for example, your Escape might skid just a bit as it tends to understeer — pushing ahead more than at the radius of your steering — the computer will send more torque to the rear wheels to help counteract that effect. Torque-vectoring sensors also calculate steering angle, lateral acceleration, and driver’s throttle input, and take pre-emptive action, adding and subtracting torque to different wheels through an electromagnetic clutch. Adding power to the outside wheels and reducing it to the inside wheels, including actually applying light braking, helps the vehicle turn the way you’re intending. One of the Escapes we test-drove was a loaded Titanium model, which went from the base $23,295 to an as-tested $35,630, with the Titanium and Parking Technology packages. Built at the Louisville, Ky., assembly plant, it weighed in at 3,645 pounds, while some front-wheel-drive Escapes start as light as 3,502. It lacks only one important feature, in my opinion, and that is an easy and intuitive method for manually overriding the 6-speed automatic. Because the Escape has such sporty power and precise control from its front MacPherson struts, and twin-tube gas shocks, progressive rate springs, and stabilizer bars front and rear, its transmission should live up to its new-found sportiness. The easy way would be to include a manual shift-gate adjacent to the shift-lever’s groove, and the vastly preferred method would be to include steering-wheel paddles to manually upshift or downshift without taking your hands off the wheel. Ford instead offers only its electronic shift on the shift knob that allows the driver to click it to up or downshift, or click it twice to downshift twice. 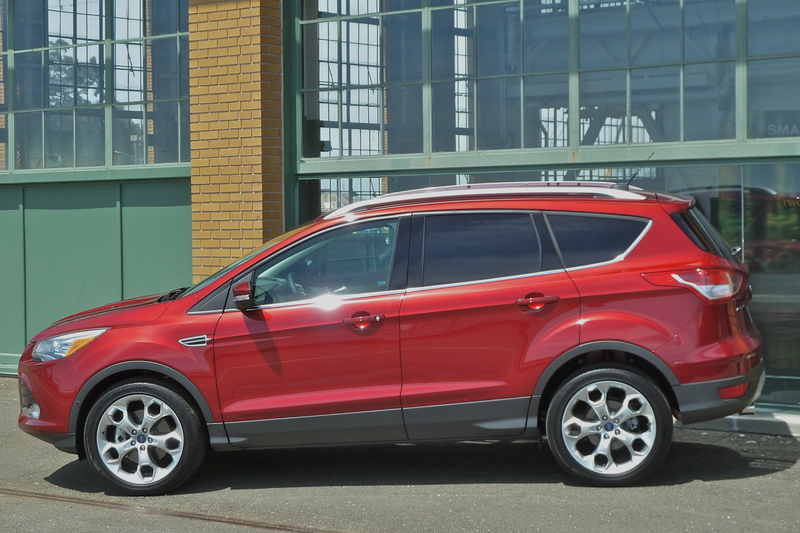 Escape Titanium boasts enough features to intrude on midsize SUVs. Ford officials claim this is all anyone needs or could want, but I tried it repeatedly but never found it approaching intuitive, so I don’t think I’d be comfortable using it. Besides, it does require the driver to take one hand off the steering wheel to activate the switch — and in a vehicle stressing SYNC for its advanced voice commands to allow drivers to keep their hands on the wheel, it seems incongruous at best. On the other hand, I have complained repeatedly about a recent Ford trend to make the turn signal stalk return to its neutral position even while the blinker is still blinking, which causes me instinctively to push it again — which cancels the signal. Ford uses it in its trucks, from the F150s down to the Flex, and in some new cars. But after driving the Escape, even when engineering director Frank Davis was riding in the rear seat with us, I never complained once about having cancelled the blinker when turning. He had to tell me why I had no reason to complain: The turn signal stalk now latches in its turn position, so all instincts from visual, to audible and to feel, inform the driver that the blinker is on. Davis and engineer Don Ufford are my favorite Ford engineering targets whenever I think I have a valid criticism, because they are both good-natured and seem to enjoy the give and take to discuss and debate such complaints. While I can celebrate the return to latching turn signals in the Escape, the vehicle is so nearly flawless that it leaves precious little for me to heckle them about.